Description: 4x5 Semisonic / Remy Zero 1995 concert handbill. Description: 5x8 Sextacy Ball 1996 concert handbill. Description: 7x9 Smashing Pumpkins 1998 double sided Japanese concert handbill. Description: 5x7 Squeeze / Grand Street Cryers 1998 concert handbill. Description: 5x7 Steve Winwood 1989 concert handbill. 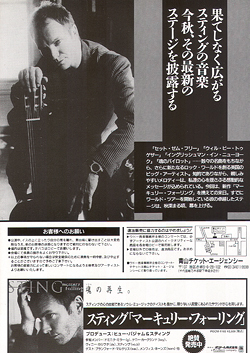 Description: 5x7 Steve Winwood 1986 double sided Japanese concert handbill. 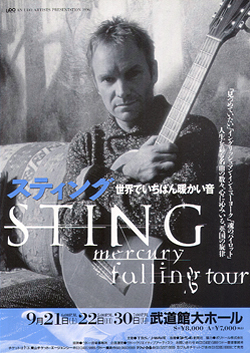 Description: 7x9 two color Sting Japanese 2001 concert handbill.